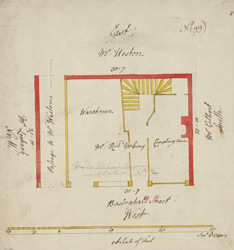 This plan comes from a rent book belonging to the Mercer's Company. One of the most prominant of the City of London's livery companies, the Mercers' dealt primarily in textiles. This is a plan of a warehouse and compting (counting) house. The names of the tenants and neighbours are recorded. Basinghall Street derives its name from the wealthy and influential Basing family, who owned a house in the street in the 13th century.